What Type of Inground Swimming Pool Is Best for the Arizona Heat? HomeUncategorizedWhat Type of Inground Swimming Pool Is Best for the Arizona Heat? Arizona’s dry heat is one of the many reasons that people enjoy living in this southwestern paradise. However, you need to consider the weather when choosing your landscaping and swimming pool materials. Doing so will ensure that you have an aesthetically pleasing outdoor area that is easier to maintain. If you are interested in having an inground swimming pool installed in your backyard, shotcrete and gunite are considered the ideal building material for the pool shell. While shotcrete involves factory-mixed wet material delivered via a concrete truck, gunite is mixed on-site. One person handles the dry powder while another adds water during the delivery. The compressive strength of shotcrete ranges from 6000 to 7500 psi, while gunite can reach 9000 psi. The stable material creates a watertight pool able to withstand more use and pressure than your other options. Steel rebar is used to further strengthen your pool. In addition to durability, shotcrete is popular due to the wide range of decorative options. While other materials are available in predesigned shapes, your swimming pool installation company can create virtually any shape you desire, adding benches and other amenities as desired. One disadvantage is that the material has a rough surface, which can be covered with other materials for comfort and visual appeal. Additionally, this type of pool takes more time and money to construct. Fiberglass pools are available in various predetermined sizes and shapes. These are manufactured elsewhere and shipped to your location. The expenses related to transport can become exorbitant and the maximum width for these wide loads is limited to 18 feet. Lowered maintenance and speedier installation are two of the benefits associated with these non-abrasive pools. Vinyl liner pools are the least expensive and are non-porous, inhibiting algae growth. However, the initial savings experienced will be lessened over the course of time due to liner replacement costs. If you are planning to sell your home, an older vinyl liner can reduce the resale value. Your pool installation specialist will inspect your soil and help you determine the best location for your new inground swimming pool. In addition to the pool itself, the surrounding deck and other amenities can be included in the transformation of your backyard. From built-in slides to firepits, modern swimming pool manufacturers have a wide range of offerings to ensure that you have a pool that you can enjoy. 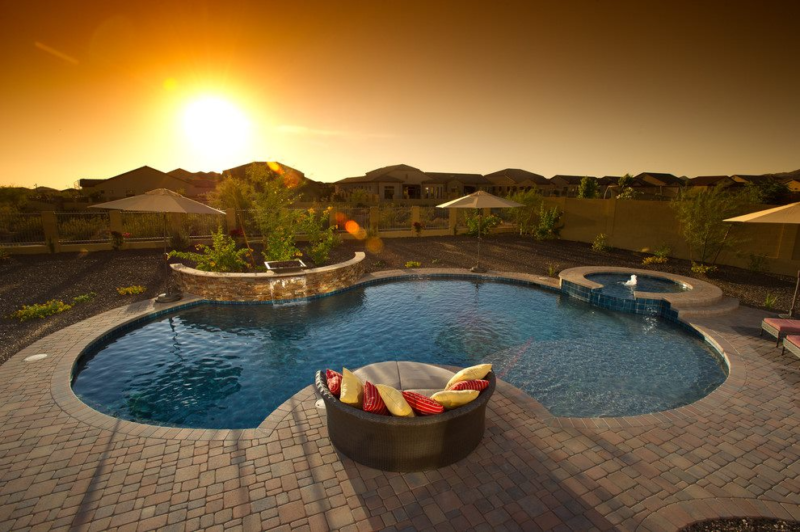 While shotcrete is the ideal material for most Arizona homes, you can discuss your concerns about the material choices with your pool builder and how to ensure that your pool is an attractive and functional part of your backyard landscaping.